As with any royal occasion, the festivities are not just limited to one occasion. Queen Máxima of the Netherlands was at Nieuwe Kerk in Amsterdam this afternoon for the royal inauguration of her husband, King Willem-Alexander of the Netherlands. 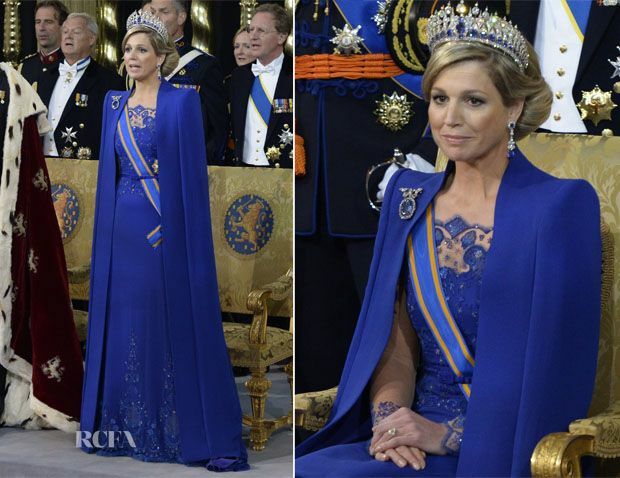 Donning my favourite colour, electric-blue, the newly crowned Queen was hypnotic, wearing a custom royal-blue Jan Taminiau gown. Her floor-sweeping gown with delicate lace-embellished panels on the bodice and skirt was styled with a matching floor-sweeping cape à la Gwyneth Paltrow’s 2012 Tom Ford Oscar gown. Opting to keep her hair styled in the same chic chignon from the morning’s festivities, she added a stunning diamond-and-sapphire-encrusted tiara, matching drop earrings and a brooch to her look, all of which once belonged to Queen Emma of the Netherlands.